Cardi B has announced the arrival of her first child – daughter Kulture Kiari Cephus. The rapper, 25, shared the news on Instagram alongside a photo of herself heavily pregnant and surrounded by flowers. The Bodak Yellow star told fans her daughter was born on 10 July. 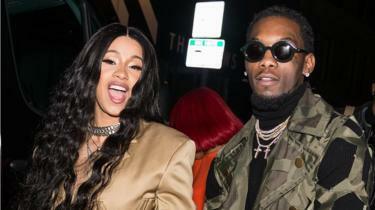 Her husband, Migos rapper Offset – who she secretly married in September – also shared the news to his 7.5 million followers. Earlier this year, Cardi B made an appearance on the Howard Stern Show and revealed she was expecting a girl. She also told the host that Offset, 26, had chosen their daughter’s name. It’s been a big year of announcements for the rapper. In June, she told fans on Instagram she had married in secret because “there are moments that I want to keep for myself”.